Wildlife Research Center® has introduced their Ultra-Premium Scent Killer® Gold® Laundry Detergent in Autumn Formula®. Serious odor fighting power now comes with a subtle hint of woods and forest. Scent Killer®Gold® Laundry Detergent is an ultra-concentrated formula that fights odors, dirt, and stains in your hunting clothes without adding any U.V. brighteners. 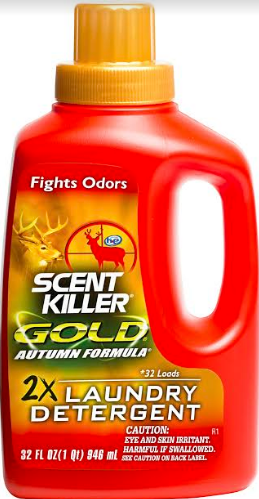 Scent Killer® Gold® Autumn Formula® Laundry Detergent works in both standard and high-efficiency washing machines. Fighting odor and subtly covering your scent is extremely important when you are hunting deer and other big game. Even though you can never completely eliminate 100% of human odor, it is important to take steps to eliminate as much as you can. A deer’s nose is like a smoke detector. Deer are constantly checking the breeze for danger. If the level of human odor gets high enough, it triggers his alarm and he will bound away. When human odor is reduced to a low enough level, their alarm is not triggered, and the deer commonly remain comfortable and moving freely in your area. Wildlife Research Center® is known for its innovative products in Scents and Scent Elimination. Although it’s been more than 30 years since they introduced their first Scent Killer® product: it’s their extreme passion and superior quality that has propelled them to be the leader in the category. Wildlife®is The brand hunters count on®. Scent Killer® Gold® Autumn Formula® Laundry Detergent is 100% Money-Back Guaranteed – direct by Wildlife Research Center®. For more information on the entire line of scent elimination products and hunting lures from Wildlife Research Center®, visit www.wildlife.com.